A Lost Life and Overflow of Emotions - A "Great" Hobby, Isn't It? I know that good home cannot be found for every homeless cat. Kitties get killed in every possible way – cold, hunger, cruelty of people, cars etc. Though, it seems unfair and cruel to find a dead body of a tiny kitten underneath the snow – eyes shut tight and little tongue reached out of the mouth. It still feels that we could have saved him, that we didn’t give our best to save his life. Here’s the story. 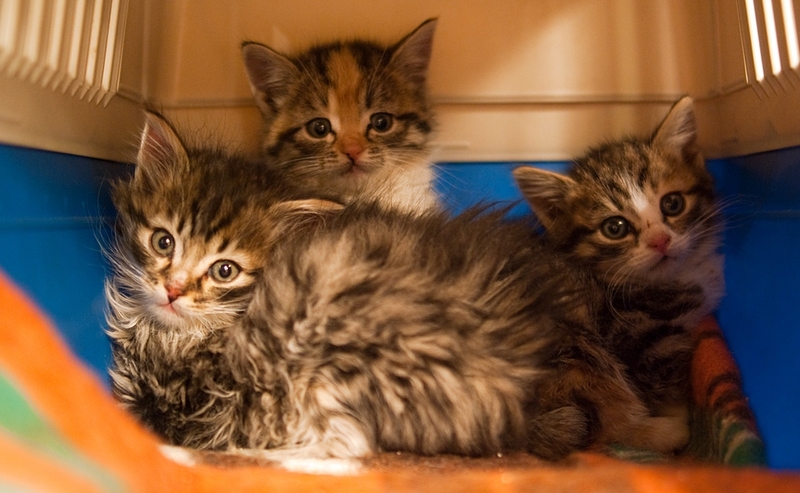 On Monday we were informed that four days after the female cat disappeared, four tiny, unsociable kittens showed up in trash pile in court yard in city centre. On Tuesday captor went to that courtyard and people told he had taken some cat with him. Later on that day, however, the residents saw three kittens and we went to catch them. There was a trap, there was smelly food inside the trap but there were no kittens. We started to worry that feral tom cats had killed them or that the freezing, stormy weather had become lethal to them. 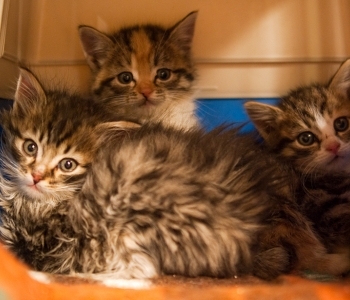 Tiny kittens like these won’t survive long without their mother in harsh conditions. But we were lucky on this snow-stormy Wednesday night – Tuisk (Whirl), Torm (Storm) and Tuule (Wind) fell into the trap and were happy that we had rescued them. Their fur was wet from the snow and they were almost starved to death. Fortunately the vet’s appointment on the next day revealed that the kittens were skinny but otherwise completely healthy. But the one missing kitten still haunted us. The captor said he didn’t catch anybody that day and so we went back to look for a missing kitty. Once again we set up the trap and waited – but nothing. We started searching the trash pile and there it was. About 30 cm from the trap a tiny ear appeared buried underneath the snow. After the other three had been taken away he was probably just too frightened and confused to look for warmth and shelter from the snow. And there he crouched alone until the snow covered the tiny frozen body. The image of him laying there just wouldn’t go away... We keep thinking that we should have kept coming back after taking the others inside. On the other hand we had no reason to believe that there was someone else to be rescued that day. But what if there were not four kitties in that litter but maybe six instead? Maybe there is another one still hiding somewhere there? OK, it’s just the overflow of emotions. It would be sane to calm down. As you can see from our homepage we have found homes for more than hundred pets and rescued many others. We have neutered female cats who have been sent back to courtyards where people feed them and they can find a shelter. This way kittens don’t have to be born on streets and the number of homeless pets will not increase. This has been a remarkable effort considering that we are all volunteers with jobs and families to take care of. But it seems to be not enough. And it will never be enough until people don’t realize that cat is a pet and it can not survive on streets. Cat is adapted to a life with humans and he needs food and proper care to survive. Fortunately the number of responsible and caring pet owners is constantly increasing. Pesaleidja has made a promise to educate heartless, sanctimonious and cruel people on proper care of pets!